What dining table size do you need? 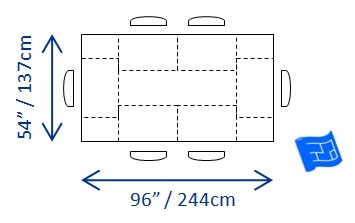 Dining table dimensions depend on how many people you want to seat, and the degree of comfort you're looking for. Here's some recommendations for comfortable dining but there are no hard and fast rules about dining table dimensions - there's always flexibility to squeeze in a few more people on a special occasion. Check out the dining room size page to find out what size room you need to fit the table. Once a circular table gets larger than 6' in diameter conversation across the table becomes difficult - this is similar to the distance that applies in a living room conversation area. The bigger the table, the more conversation will tend to be with people next to you on the table rather than those across the table. I've been to banquets where there are 12 people sitting around a 6' table. It's a bit cramped but it's perfectly possible as long as the chairs fit. You can use the rectangular dining table dimensions for the width and length of an oval dining table. 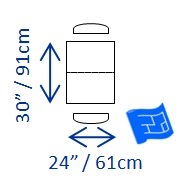 There are some dining tables included in the free floor plan symbols pdf. Need a Bigger Dining Table Size? When you’re thinking about what size of dining table you need it’s often the case that you’ll want to be flexible about how many people you seat. All shapes of table can be designed to include leaves which expand the capacity of your table. If you do go for a table with leaves, check whether or not the leaves are stored within the table design, or whether you’ll need to find another storage space for them. Another idea for accommodating more people is to have another table somewhere in the house (maybe in the home office) that is the same width and height as your dining table. Then you can use this table to get more people together for a meal. Dining tables tend to be made to a standard height of 30 inches (76cm). When you're choosing a table or chairs, always remember to think about how the chairs work with the table. Dining chair seat height is usually 18" (46cm) high. Some tables have a kind of fringe under the table surface which strengthens the table but decreases the distance between knees and an obstruction. 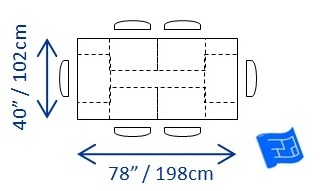 Does the width of the chairs allow you to seat the number of people you want around the table and how do the chairs work with the spacing of the table legs? Always try out the chairs and table together before you buy. How Much Room Does Everyone Need? The dining table dimension guides are derived from the amount of space that people need at a dining table. You can think of a dining table as having two types of area – a place setting area for each person and a shared zone where the serving dishes, salt and pepper and other condiments and – if you’re looking for a bit of atmosphere - candles. 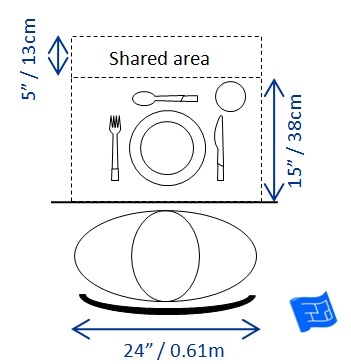 The minimum width required for a place setting is dictated by the average shoulder width of a person – 24 inches (61cm) and the minimum depth required for a place setting is dictated by the size of a plate with cutlery and a glass. 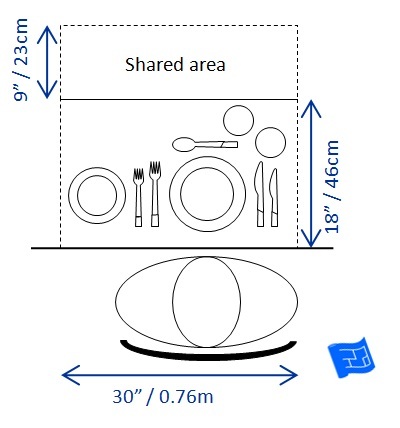 The minimum shared area (which would be doubled in a table scenario with two place settings opposite each other) is derived from the dimensions of a serving platter. If there’s no need to have a serving platter on the table then there’s no need for a shared area. The ideal dining area dimensions are derived slightly differently. The minimum width is derived both from a more formal table setting with extra cutlery, plates and glasses and there will be less elbow fights. The ideal shared area means there's plenty of room for serving dishes, candles and center pieces which give the dining experience a more spacious and luxurious feeling, while still being within reaching distance for the diners and making it possible to hear conversation from the opposite side of the table. What does this mean for table size? This means that the minimum dimensions for a rectangular dining table for 6 would be 78" x 40" (203 x 102cm), and puts the ideal dimensions for a rectangular dining table for 6 at 96" x 54" (244 x 137cm). I'm sure we've all come across dining tables that are 36" wide (91cm) which work quite well. It all comes down to your dining room size, table size and how much space and comfort you want for each guest. At the moment I'm using a dining table that's 36" x 96" (91 x 244cm) that can seat 8 in reasonable comfort with candles and wine in the middle. I use a sideboard for any serving dishes. Dining for 8 - there are overlaps and not much shared area but it still works. And often in restaurant dining there's no shared area at all. 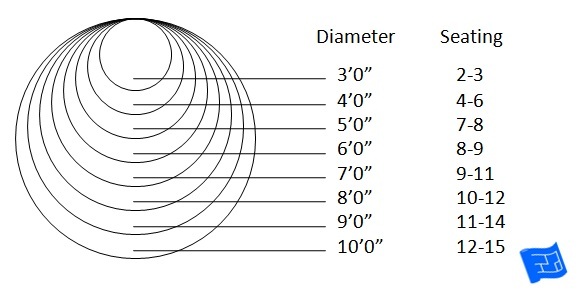 Given the comfortable eating dimensions for individuals eating here are the minimum and ideal sizes. Notes - the 'No shared area' column represents a seating arrangement where there's nobody occupying the ends of the table. 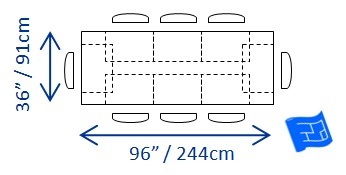 For the 10 person 'minimum size' and 'ideal size' arrangement there would be 1 person occupying each end of the table. For the 12 person 'minimum size' and 'ideal size' arrangement there would be 2 people occupying each end of the table. You can use these dimensions for hexagons (for 6) or octagons (for 8) etc measuring flat side to flat side through the center of the table. You could squeeze 12 people around a 7' table. Any bigger than a 7' square and you're better moving to a rectangular arrangement.